Make some tea or coffee, find a pen and piece of paper, the new Weekday Escape is out! We start with Neat Escape in a hotel, where you find yourself locked without a key and without a breakfast. After you escape, tomoLaSiDo locks you in another room, where is TV which surprisingly doesn't need remote controller (it's probably mind controlled) and more or less hidden fifteen strawberry cakes. Lovely Denofthekamo's game is overall pink, relaxing and full of cute animals and toys. Neat Escape takes you to a hotel - but don't expect luxury or tradition, this is anonymous hotel room which can be anywhere, simple and functional and with private facilities. Not bad. You are locked here and needless to say, without the key - and all drawers and even fridge are coded. One code is in Japanese, all you need to do is copy the clue after you find it. If the drawer doesn't open, repeat - sometimes the first try isn't successful though the code is correct. Don't give up. Nice breakfast is waiting for you! note:The speed of loading fluctuates a lot, from normally slow to extremely slow. tomoLaSiDo is a bit late with their strawberry themed game; we went over strawberries two weeks ago in WE N°177...well, never mind, it has arrived now and it's lovely. First, don't be afraid of language barrier! There are few notes in Japanese, but you don't need to understand them at all, game is easily playable without knowing what are the notes about. Your goal is to collect six blue and white balls which contain parts of the key from exit door - current state is in the lower right corner of the gamescreen. Side quest is to find fifteen mini strawberry cakes; they aren't necessary for the escape, only for fun. The cursor is changing, no save button, two endings (with or without all strawberry cakes). P.S. May we get the round window back, please? How about taking a break? 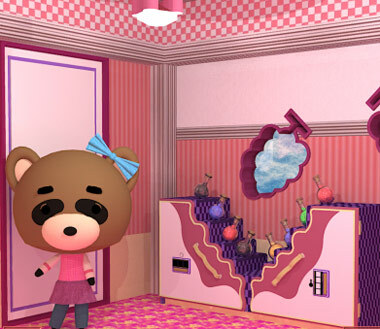 Adorable game by Denofthekamo (earlier Kamotokamotokamo) takes you to one of their sweet "kid's rooms"; toys everywhere, soothing music rings around and two raccoon girls are watching you...what do they want? There is something you can do for them - and if you give them what they want, you'll get rewarded - and get two steps closer to the escape! Don't hurry, take your time, it's a slow game and not a race. what the dish with the broccoli seen in the end screen is? You've enjoyed a good night's rest in this hotel, but will you ever make it out in time for breakfast? The hotel is decorated very simply, where two beds each have just one pillow, a lamp on a table between them which doesn't work (because its bulb is missing), and a picture above seems to be all dusted up. You can zoom in on the curtain and draw it to find a remote control without batteries. Lift the pillow on the left bed to find a pair of nippers (wire cutters). Look under the right bed to find something hanging from the frame, and look under the left bed to find a card beneath. You can't reach either of them without extra tools. Turn right to face a simple table with another dusty mirror and a TV that's currently off. The desk drawers are locked, one requiring a sequence of three kanji characters, one requiring three red digits and one requiring three blue digits. The mini-fridge also has a four-letter lock, and it's marked with a star. Looking closer at the cups above, you can lift the right one to find a battery beneath it. In the wall to the right, there's a pair of small metallic doors that are shut tightly. Turn right to face the room's exit door (locked of course) and the bathroom door, which is unlocked. Pick up the stick hidden on top of the exit door. Entering the bathroom, you can zoom in on the sink. The tap is turned to dispense water into the bathtub, where it just drains away. Reach under the left bed and use the stick to retrieve a blue towel. 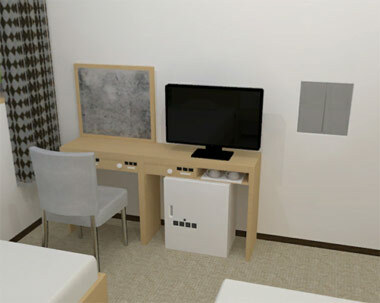 Use the towel to clean up the picture above the beds, which curiously reads "bushido", and also use the towel to clean up the mirror on the desk, which shows you a reflection of the chair. Then use both of those clues on their respective locks. The 武士道 clue fits in the left drawer, but you have to be careful about characters that look similar. Click the buttons exactly 3, 5, 2 times to unlock the drawer and get a lightbulb. The chair clue is FREE reversed, so enter that in the fridge to unlock it. Inside, there's a cup with another battery. Place the lightbulb in the lamp, and turn it on to find three red digits on the lampshade. So use that clue to unlock the middle desk drawer. Enter 555 in the drawer, then open it to find some bath salts. Reach under the right bed and use the nippers to remove a rubber stopper. Place the stopper in the tub, and turn on the tap. After a short while, the tub becomes full. Place the bath salts in the full bathtub, and it forms the shape of three digits in blue. Curiously, this clue doesn't work on the last desk drawer. Is something missing? Place both batteries in the remote, and use it to turn on the TV. Then use this clue to unlock the last desk drawer. The clue indicates that you should add 11 to the number in the bath. The total you get is 873, so enter that in the drawer and open it to get a saw and a big red button. So push the button, and you hear something unlock. The compartment beside the table has opened up, but it slams shut whenever you try to reach inside. How do you stop it from doing that? Saw the stick into two shorter halves. The shorter sticks fit exactly between the two doors, holding them open. Now you can open the wooden box inside to find a key. Use the key on the exit door to escape. Enjoy your breakfast! Maybe tomoLa felt that a square window was a better fit for small and cute cakes with strawberry toppings. 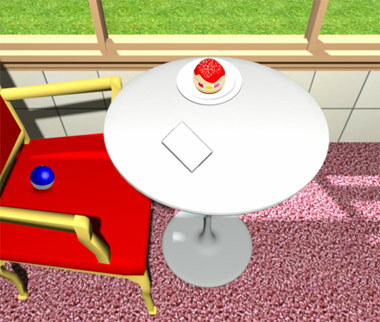 A bright red chair with a key piece on it sits beside a small round table with a strawberry cake and a card with digits, a smudge and "lucky mode" written on. The non-round window and the potted plant on the right side are uninteresting. Turn right to face a large cabinet with picture frames on both sides. The cabinet has two clear glass doors, and you can slide the left one over to get 5 cakes, but the right door has a three-digit lock with bright colored backgrounds on the buttons. Below that, there are two drawers. The right one contains a cake, and the left one is locked with three colored buttons. Below that, there are two more sliding doors, the left having three colored buttons but arranged vertically, and the right having four square buttons in a grid that flash when clicked. Turn right to face the locked exit door and a spinner machine which you can't seem to start up. There's a keypad hidden on its right side of the machine. Turn right to face a wall where a clock is missing two numbers from its face, a TV shows the steps that go into making a cake, and a bin hides a key piece on its left. Head into the corridor leading to the toilet, and pick up the eraser on the toilet bowl. As usual, you can sit down, look right, look up and then look left to find a small pencil drawing. Use a clue from the room's decoration to unlock the lower-left sliding door of the cupboard. The walls of the room are entirely white except for three colored stripes. From top to bottom, they are blue, green, red. So click the buttons 2, 4, 3 times to unlock the door and find a key piece inside. Use the clue from the cakes to unlock the left drawer of the cupboard. The fruit slices in each cake are red, yellow, pink. So click the buttons 3, 1, 4 times, then open the drawer to find a key piece. Use the clue from the television to unlock the lower-right sliding door of the cupboard. The step numbers (1 to 5) appear at the UL LL LR UR LR corners of the screen. So click the ⌜⌞⌟⌝⌟ buttons to unlock the door. Take a cake and key piece from inside. Use the clue from the clock to find its missing numbers. The missing numbers on the clock face are 1 and 5, so click the 1 and 5 squares on the right picture frame to find 2 coins with those numbers. Also click the large square numbered 15 to find a cake hidden behind. Placing the numbered coins on the clock face, you find that the circled numbers now light up in three colors, with the lights spinning around the clock face and stars coming out from the center. So use that clue to unlock the top-right drawer. When the stars land on the pink, yellow, cyan circles, those circles are lit on the numbers 2, 5, 6. So enter 256 in the door to unlock it, then take 5 cakes from inside. Use the clue from the note on the table to play the spinner machine. Enter 21478963 in the keypad, and the light beside it shines light blue. Now you can press the start button. After a few tries, you get the last key piece. Using the eraser on the note reveals another phrase: "terrible!". What could that mean? It's another number pun for the phrase on the note (yabaiyo). So enter 8814 into the keypad, and the light beside it turns red. Now you can spin it to get a terribly misshapen cake! Now that you have the whole key (and all the cakes), you can unlock the door to leave. Your exploration of this room starts with some curved purple couches around a small round table where a safe has a bowtie above its two buttons (and on each of them). Turn right to find one of the sisters wearing a bright blue bowtie on her ear. She stands in front of a door and you need to get her a glass of grape juice. Next to her, there's a shelf where eight flasks with different-colored contents are arranged diagonally. Built into the front of the shelf are a three-digit safe with a circular mark above and a four-color safe with a flask-shaped mark. Turn right to find two shelves shaped like purple trees. Among all the cute animal toys, there's a decoration with five bowties mounted on a pink arrow, and an unusual picture of small boxes (crates?) in a large box (room?). There's also a cupboard here with four doors. The top one needs a key to unlock, the second one is locked but has a star-shaped hole, the third is unlocked and holds a purple marble and a clue with flasks, and the bottom one is locked with four lettered buttons (from A to D) forming a square. Turn right to find the other sister wearing a yellow bowtie on the other ear. She wants a grape-flavored popsicle, but at least she's not blocking the door here, which is locked and needs a key. Use the clue from the sisters to unlock the box on the first screen. The sisters which wear the blue, yellow, yellow, blue, blue bowties do so on their LRRLL (our RLLRR) ears. So push those buttons in the box, then open it to find a popsicle. Deliver the popsicle to the sister who wants it, and she gives you a purple marble. Now you can access the shelf which was behind her, which has three globes with the left and right halves of each striped differently. Beneath the globes, there's a drawer with several rounded wedges, each of which has a square button with the sisters' faces. Beneath that, there's an unlocked drawer with a handsaw in it, but it's safely bolted down. Use the flask clue in the cupboard to unlock the four-color safe in the flask shelf. The clue tells you to look at the top three flasks on the right side of the shelf and the bottom flask on the left. Those flasks are red, green, blue, black, so click the buttons 1, 2, 3, 4 times to unlock the safe. Inside, there's a photo book with more pictures of crates in a room, and a purple marble. Use the clue from the photos to unlock the bottom cupboard door. Each of the pictures labeled A to D represent one of the walls in the room (shown on the picture on the right tree shelf). For clarity, I'll name the walls by compass directions, with North on top. Looking at picture A, you notice that it's the only one with a crate stack in the middle of the wall. So this is the north wall. Each of the remaining pictures has a pyramid of crates. D is the easiest to find, because the pyramid is on the left. So D is the south wall. B and C are very similar, but you can see in the overhead view that the pyramid at the south of the east wall has no gaps in it, and the crates at the middle of the west wall are less aligned to the wall. So B is west and C is east. in the cupboard door, then open it to find a wood piece marked with a star, and a diagram of the cupboard with a red arrow included. …to find another picture with a grape outline on an unusual background with a question mark next to it. …to find a hidden compartment with a rabbit-shaped metal piece. Picking it up, you realize that it's a spanner! Use the spanner to unbolt the handsaw from the bottom drawer beneath the striped globes. Then use the handsaw to cut a star piece out of the wood. The star piece fits in the second drawer. Now you can open it to find a glass of grape juice. You can also turn the grape clue around to find another clue with a vaguely cloud-shaped blue area. Give the grape juice to the other sister, who gives you a purple marble and leaves the screen. You can now walk to the next room, but we still have some things to do here. Talk to the sisters again to get the used popsicle stick with a key tip on the end. to unlock the top door of the cupboard. Inside, there's a purple marble on a clue with a brown area. Use the clue from the sisters to unlock the top drawer beneath the globes. The sisters with the yellow and blue ribbons sit on the left sides of the top and right chairs. So click those two buttons once and twice respectively, then open the drawer to find another purple marble. The first thing you see in this new room is shelves of semicircular striped cards, each attached to a rectangle with a green symbol. On the right side of the room is a fake-looking tree with a bunch of grapes painted on it, except that all eight of the grapes are missing. Turn around (left or right) to face the door where you came in. There's a box to the left of it with three buttons arranged vertically, each showing an animal between two colored stripes. Use the clue from the striped globes and semicircles to unlock the three-digit safe on the left side of the flask shelf. The corresponding green symbols combine to form the digits 5, 4, 9, so enter that in the safe to find a purple marble and a clue with a purple area. Use the clues with the colored areas to unlock the box in the second room. The purple, light blue, brown areas indicated in the clues are the right, top, top compartments of the right, left, right tree shelves. Those compartments contain rabbits, dogs, ducks, so click the buttons 0, 3, 1 times, then open the box to find a purple marble. Now that you have all eight marbles, use them on the tree in the last room, which dispenses a tanuki key with both the sisters' bowties on. Use the key on the remaining locked door (in the first room) to leave.